I have to be careful not to boast about the current situation in my house. I remember once boasting on my blog about a rare album I had received, many years ago, one that I managed to get signed by the performer. "Lookee what I have," I wrote, and I immediately received a rather nasty comment--one that I chose not to publish, of course--one that said "Nobody cares what you have, you spoiled little brat! Start being professional!" Despite the fact that the comment was sent by "anonymous," I had a pretty good idea who sent it. It was a fellow reviewer, one far more famous than I, and it pissed me off. So many audio reviewers are matter-of-fact about their "vocation," so much so that the joy about ultra-cool audio gear is no longer there. It's a job. Just get it done and stop gloating. I beg to differ, of course. Now that I'm settled in to my new role as Managing Editor of The Occasional, with two issues under my belt by the time you read this, I feel genuinely blessed (a word, as a confirmed agnostic, that I'm reluctant to use) to get new equipment in for review. It's something I don't want to take for granted. Years ago, when I wrote for another hi-fi magazine, I held the same boyish enthusiasm I have now. Those who have followed this column for years know that I felt ultimately disillusioned after turning my beloved hobby into a full-time job. It was more than meeting deadlines and finding colorful adjectives to describe the sound I was hearing--it was seeing the underbelly of reviewing where I had to balance my own honest opinions with making other people happy such as manufacturers and editors and advertisers. This cynicism is encapsulated by a story, one that I've probably told before. It's about pull quotes, the little blurbs that manufacturers use in advertisements, the ones that quote reviewers to show that the product is highly regarded by stalwart industry writers. I've only had one of my quotes appear in one of these ads. It said something about a particular amplifier being "a giant among other amplifiers." It was a nice quote, and I enjoyed seeing my name in print ads, but the simple truth was I didn't write that. The editor, who was trying to please the manufacturer, wrote it. My actual review was kind of neutral since I wasn't really that fond of the piece. Since I started this new gig last fall, I've reviewed a number of products--speakers, digital music servers, headphones, integrated amplifiers and more. So far I've enjoyed every piece of gear, resulting in highly positive reviews, but not because I was trying to make anyone happy. I now have the power, so to speak, to pick and choose what I review. In other words, I'm talking about things that interest me and have already received a modicum of buzz among audiophiles. I've had pretty good luck picking winners so far. After getting this first round of reviews completed, I had a stubborn thought: "I heard there were going to be turntables?" 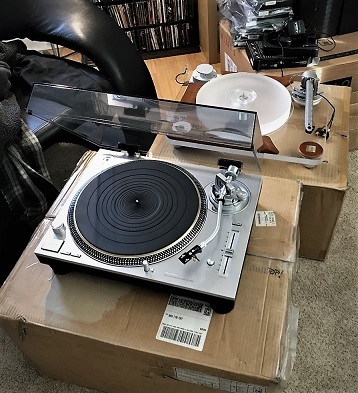 And so, for my next round of reviews, I've received a number of turntables, tonearms, cartridges and step-up transformers (which boost the signal of low-output phono cartridge). To put it succinctly, I'm in Hog Heaven. It's Christmas and my birthday, all wrapped up as one. In my last column, I spoke about the seduction of the latest digital components, and how these new technologies are so awesome that it's taking time away from spinning records. I can no longer complain about that predicament. From the photos, I've included here, you'll probably notice a Technics SL1200. That's right, the 1200 Army's biggest villain is taking another crack at that direct drive legend, but as I've mentioned several times in the last couple of years, the new 1200s are a completely different beast. Technics has taken my criticisms to heart (just kidding), and the new generation of SL-1200s are completely different animals that sound incredibly good. While this SL-1200G, which retails for $4000, looks a lot like the classic model that sold in the millions for about $500, it is a much more refined design that results in a sound that I've instantly adored. I named the 1200G the Turntable of the Year a couple of years back, and now I get to play with one for an extended amount of time. I can't wait to get it into the living room system. The other turntable you'll see in the photos is a Dr. Feickert Analogue Firebird turntable from Germany, a heavy beast that might be the finest analog machine I've had in my possession. This turntable is so massive, and so heavy, that I can barely pick it up by myself. Colleen had to help me bring it in from the car--we had to hoist the enormous box through a foot of snow on the front lawn. I've never had a turntable of this caliber, one that features two tonearms (a Jelco and an Origin Live, with a couple of exotic Japanese cartridges already mounted), in my home. 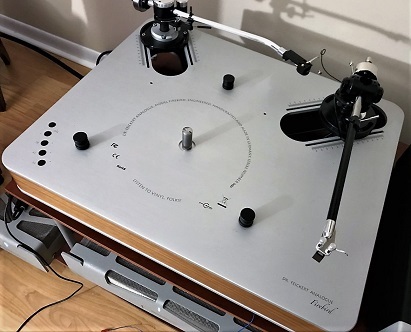 I've had plenty of wonderful turntables in the past, but this is something that should give me a new hands-on appreciation for these lofty and thrilling machines. I'm also trying out a few step-up transformers with this rig--a Miyajima and a couple from Bob Satin of Bob's Devices. I had a step-up transformer before, with my gorgeous Yamamoto Sound Craft gear from a decade ago, but it's been a while since I've needed one. 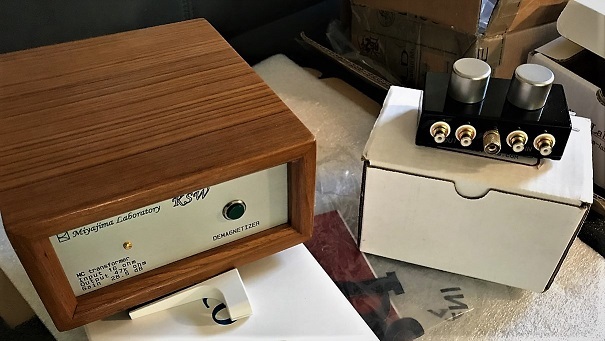 Step-up transformers are unusual in the sense that they are usually reserved for premium analog rigs--these simple passive devices (which means they don't get plugged into a wall) simply increase the signal from low-output cartridges. They are similar to the moving coil section of a phono pre, but they are much simpler and purer ways to supply juice to the speakers. You can use them alone, or in combination with a phono preamp. It's what the big boys use to get the best performance, and I'm finally getting a chance to confirm that. Okay, okay... it does sound like I'm gloating about this gear. But that's not the point. I once invited an audiophile to my house to listen to a system that was made up of gear I had in review. I kept mentioning the cost of each piece, and he took exception to that. He thought I was boasting about how much my rig cost, and that I was too impressed with price tags. The only reason I mentioned said price tags was because I wanted to give him a reference point. After all, 99% of audiophiles will ask one particular question when they see a piece of gear at a dealership or an audio show. I'm not gloating. I'm excited. I'm enthused beyond belief. Everyone should feel that same sense of wonder and excitement with gear like this. It should be fun, dammit. 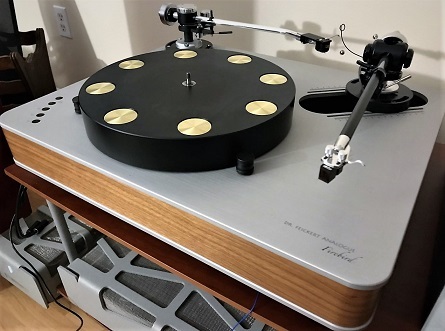 When you buy a new piece of gear, or anything, for that matter, you should feel the same thing whether it's a Crosley turntable (meh) or a $200,000 turntable from Continuum or Kronos or Clearaudio. You're about to listen to the music that you love on something that will reveal new depths, new details. Recently I subscribed to the new Qobuz streaming service, which is similar to Tidal but contains more high-resolution recordings in the catalog. The first album I listened to on a pricey digital server and DAC was the newly remastered version of The White Album. It was quite a singular experience hearing something that I've heard a thousand times before, but now with so many new details, a little flourish of keyboards that I never knew was there, or hearing more notes from Paul's bass, or knowing exactly who was singing what in the background--even Yoko. It was almost a religious experience for me. That same feeling can be achieved through almost any improvement you make to your system, whether it's a new piece of gear or simply improving the placement of the loudspeakers you already have. That's why I'm an audiophile. That's why so many people spend way too much money on this hobby. Both a Ferrari and a Kia can reach a speed of 100 miles per hour, but they don't feel like the same thing doing it. One will get your heart racing like nothing else, and the other will just be irresponsible and somewhat sloppy. So forgive me if I sound like I'm rubbing it in. I'm going to have a lot of fun now, and I'm hoping that every music lover out there is exposed to that same wonderful sense of pure joy that comes from something new, and something very, very good.